All cats for adoption come spayed and neutered and free of internal and external parasites. They have had their first vaccinations and are dewormed. They come with flea medication, food, bowls, a litter box, litter, a bed, a kennel, and microchip on request. Potential parents must fill out an application. We will request a home visit before you can receive your pet. Adoption fee for cats is $100.00 USD, payable by cash, paypal, credit card or money order. AHH HHA Inc. found us homes and now we have someone to curl up to again. Thank you AHH HHA! My name is Flame Tortie and I am so happy to be adopted. My name is Camille and I love my new home more than catnip, and I love catnip -- a lot. 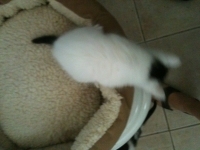 My name is Lemur and I am bounding up and down over my new home. My name is Dipstick and I was revving to go to my new home. My name is Snowfeet and I finally found a place that fits me like a glove. My name is Tigger and I bounced all the way to my new home. My name is Toes, and I have extra toes, which are better to play with my new family with. My name is YingYang and I have to say the feng shui at my new home is pretty great. My name is Speckles and I have a new family who loves me, spots and all. My name is Orange Sherbert and I am so sweet my new family could not resist me. My name is Star and my new family thinks I am the brightest. My name is Orange Popsicle and my new family thinks I am the coolest. My name is Knight, and to my new family, my black furry coat is a shining armor. My name is Marriot and my new family rates me 4 stars.